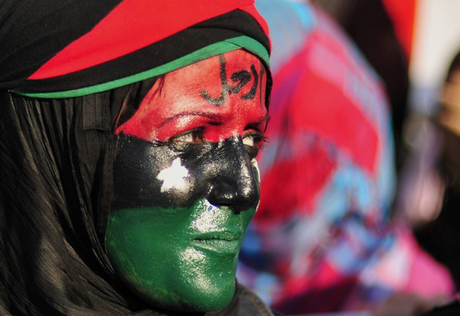 A woman with her face painted in the colours of the Kingdom of Libya flag attends a protest against Libyan leader Muammar Gaddafi near the court house in Benghazi June 29, 2011. The word on her forehead reads, "Leave". (June 30, Tripoli, Sri Lanka Guardian) Entering Libya from Tunisia, the roughly 115 mile drive to Tripoli currently provides a fascinating if unsettling introduction to the current situation in Tripoli. By the time I arrived at the hotel my mouth tasted as if I had sipped kerosene and my clothes reeked of the same. The reason is that the acute petroleum products shortage has meant that Tunisians and others are transporting for quick cash, whatever they can get to Tripoli to supply thousands of cars that are stranded along the roadside without fuel in their tanks. Just about every opened car trunk I observed being inspected randomly at more than 50 check points between Jerba, Tunisia and Tripoli, Libya, were jammed with full plastic fuel containers. Many apparently leak and over the past three months have left a heavy pall and stench for nearly one hundred miles. Some trucks, loaded with perhaps close to 1000 55 gallon drums of gasoline seemed quite ready to topple over from being seriously top-heavy with the center of gravity being at tire level. Bread, children toys as well as dry and canned goods also fill many cars. The western press tend to stay in their hotel and seem fairly biased in favor of the rebels. For sure what the BBC is saying about what happens on the streets at night is nonsense. I needed to use the internet at their hotel and returned to mine at 3 am and the streets were quiet with a modest police presence at key intersections. Currently it is very peaceful here with most shops open, and people going about their lives. Since the beginning of NATO operations a total of 12,887 sorties, inclduding 4,850 strike sorties have been conducted. On Monday June 27, 2011 there were 142 sorties and 46 strike sorties. A total of 17 NATO ships are patrolling the central mediterranean sea off Libya. To date 1,546 ships have been intercepted and 127 boardings made. Weapons used on Libya include tow missiles, mk 82, 83 and mk 84 bombs, i.e. 500, 1000, and 2000 pd and an assortment of missiles. according to the Libyan Red Crescent Society statistics. These civilian targets include the Libyan Down's Syndrome Society, a school that provided speech therapy, handicrafts and sports sessions for disabled children as well as Tripoli’s Nassar University, homes, schools, medical facilities and food storage warehouses, Bombing these sites are all outlawed by the Geneva Conventions and constitute NATO war crimes. An additional large documentation project by international organizations is expected to be completed by July 30, 2011. Those who have pulled together the initial but detailed stats include the the Libyan Red Crescent and “The Fact Finding Committee on the Current Events in Libya When the July study is published it will surprise many. NATO is running out of targets. It is now rocketing local village police personnel who are stationed along certain intersections and roundabouts. When you approach a checkpoint it’s blacked out and the officers come out with a small light to check you out. The main attitude one encounters on the streets of the old city such as Avenue Omar Muktar, is defiance and strong nationalist support for Libya’s Revolution. The June 27 International Criminal Courts (ICC) arrest warrants issued for Muammar Gadhafi, his son Seif al-Islam Gadhafi, and Libya intelligence chief Abdullah al-Sanoussi, however pleasing to the “rebels” and NATO, probably won’t have much effect on negotiating a settlement between the two camps and certainly the warrants will not facilitate a voluntary regime change. Quite likely, the warrants’ effects will tend toward the reverse, with the Libyan government ignoring, but ridiculing the much criticized ICC and pointing out its historical pattern of targeting African leaders. At Tripoli’s Rixos Nasser Hotel, just a few hours after the arrest warrants were announced, Libya’s Justice Minister and a high ranking Foreign Affairs official did just that and then refused to take any questions from the large gathering of western journalists of whom Libya is distrustful, given the spate of recent false press reports that have been exposed as hoaxes. Colonel Qaddafi and his supporters proclaim that they will prevail in reunifying Libya and probably before Ramadan which begins, this year, in early August. They argue that the “rebels” are increasingly fighting among themselves and are losing popular support. It’s an argument similar to the one the “rebels” are using to explain how their victory is all but assured, also by the end of Ramadan. Tuesday morning, during a long discussion with an official at the Libya People’s Congress HQ in Tripoli, the General-Secretary told me that more than two million of the 3.5 million Libyans over 18 years have been armed and are training to fight NATO when/if they arrive on the ground. Virtually everyone who is asked gives assurances that Qaddafi will not flee but will, if necessary, die defending his country. More than once officials confidently stated that Qaddafi will be here after US President Obama is rejected by the American people in the 2012 election. Support for this idea is found in the seemingly widespread support Qaddafi appears to enjoy and also certain “benefits” resulting from a certain Libyan pride in five million citizens still full of resistance after 100 days of facing 27 countries. NATO’s bombs have united the people; forced the sometimes too comfortable population to face the future; even one without Gaddafi; demonstrated the media strikes with false stories are stronger than the military assault in some respects, shown that the “Arab system” i.e. Arab League is worthless; shown that it’s the poor people of Libya who believe in the Revolution and are remaining loyal to it. The rebels have exposed the Muslim Brotherhood as a US partner and also has shown the true nature of the Jihadists, Al Qaeda and NATO itself, that the African Union has a key function to perform, that Libya is not divisible because of its social and economic interdependency. Libya must reform and reject the IMF system and learn from its mistakes in trusting the US and certain countries in 2002 when it gave up certain weapons systems and placed billions of dollars in American banks. Due to the crisis women have stepped forward and are surprising many by “taking charge” of many governmental functions and encouraging the population to defend their country. Libyans are saying that they have to rejuvenate their revolution and rely on themselves. Nearly everyone is claiming that Libya was deceived in the 2004 negotiations and agreement with the US and Western countries. They admit that they have paid a big price in terms of lives lost and infrastructure damage. Libya also intends to continue their gold based currency project and to improve relations with African countries. Libya’s squeezing the former French colonial power out of most of Africa is one motive of that country to seek regime change. The Libyan government has plenty of documents supposedly captured from the rebels. Amazing if true, since they allegedly document French government arms shipments thru the port of Miserata etc to the rebels.